The Biblical World: Jesus and Tattoos. The Vancouver Sun has an article on the popularity of tattoos among young Evangelicals. I don't have a tattoo for two reasons. First, I don't like pain. Second, if I ever had a tattoo it would be of a ship. But I fear that as I get older the ship would appear to be sinking. Another reason I probably don't have a tattoo is because when I was growing up the church considered tattoos to be a sin, the kind of identifying marks that were not for the follower of Christ. The tattoo was taboo. But for many younger (and not so young) Christians, the taboo of the tattoo has faded. And people are permanently painting their body with everything from crosses to Bible verses. And I have seen some people with some permanent mistakes. I once saw a tattoo written in Hebrew on the back of a young girl's neck. Two things struck me about the tattoo. First, that must have hurt! Second, it didn't make any sense. I then learned that whoever had drawn the tattoo had misspelled the Hebrew words which meant she no longer was marked by her favorite Bible verse but a bunch of gibberish. What struck me about the article was this open description. The sentiment captures Bonde’s desire to be in an intimate relationship with Jesus. The lanky 23-year-old, who wears bluejeans and black platform shoes, is one of a growing subculture of evangelical Christians who are flouting their religion’s straight-laced past and adorning their bodies with permanent religious tattoos. My initial reaction is that this poor individual has some rather shallow theology forever stamped on her body. It seems to me that people's unhelpful theology will now be with them for a very long time. What do you make of this? Is tattooing an expression of one's love for God or is it a cultural fad? I read the article and thought, "Gee, this is old news." I remember being one of those sandal-footed, (actually, barefooted), hippie-types who followed Jesus back in the early 70's. As far as body art and piercing, this has been pretty much standard fare for young folks since the 80's. And this, all in the church. So, as far as the shock nuveaux effect, maybe Canada's just a little behind. I'm really not convinced about tatoos being a sin. When I was growing up you would see tatoo's on two groups of people, those who had been in the military and biker groups. In today's culture I see them in all age groups and all walks of life. I feel more concerned about the potential health hazzards that may be involved, such as infection or even the flesh eating staff. However, I am told by those who have recently gotten a tatoo that reputable tatoo artists use new sterile equipment with each procedure and must past health inspections. As for religious inscriptions - one certainly cannot deny Christ if wearing a biblical inscription or emblem. And as for how Christ will respond, He has consistently looked at the heart of the person as opposed to the outward things. I beleive He will continue to look at the heart of His people even if they are branded with tatoos. oops, spelling - staph infection, not staff. I agree with Bryan, that tattoos ate BOTH a cultural fad and an expression of one's love for God. It's like wearing a cross necklace that one can never take off. However, in 200 years when archaeologists start digging around to see how we lived, there will be no evidence left of all the tatoos emblazoned on the people of today, unless of course, they find mummified remains. Evidence will only be in the written records and the tattoo tools left behind. I still struggle with tattoos and where I stand on them. I know that Lev 19:28 says not to get a tattoo, but I wonder if it refers to ever or just in relation to remembering the dead. Then, you have 1 Cor 6:19 that talks about your body being the temple of the Holy Spirit. So, if you get a tattoo, is that like vandalism on a church? When it comes down to it, we need to make our walk with Him better known to others so that we don't have to paint it on for others to figure it out. I think tatoos in the right context are perfectly acceptable. Personally, I have one (two) of those tatoos referred to in the article. 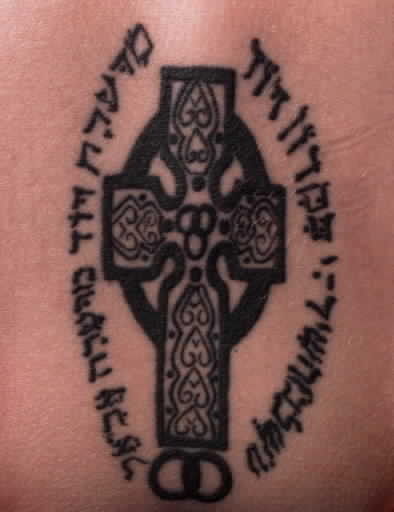 It reads "resurrection and life" in the Greek on the insides of my wrists. (John checked them and they are spelled right.) I got them in memory of my son who died after 24 hours of life from a heart defect. I also got them to remind me of the future where death doesn't have final victory. I don't know if that makes me trendy or proclaiming God's love. And I don't really care. I'm not opposed to tattoos, but I don't encourage them either. There, that's out of the way. :-) With regard to the article, I'm not sure what bothers me more: Bieber's lamentable use of Gal 6.17, the poor theology of the girl sporting Cant 6.3, or her having a "tramp-stamp" while calling Jesus her "lover." I personally don't like tattoos nor do I want one on my person. I have yet to figure out why anyone would want to inflict intentional pain on themselves in an art form akin to branding just to show that they have a particular interest in something. oh as someone who has tatoos... they don't hurt nearly as bad as people here are making to be.